Packing Services — thinking inside and outside the box. Verity Van Lines knows everything in your home is valuable to you. With 20-30 years of experience under their belts, our packing professionals can pack both typical and unusual household items to withstand any move — from your basement to the finest china. All of your delicate items and china are wrapped in clean, white wrapping paper and placed in cartons. Mirrors and pictures are wrapped in stronger paper for additional protection. Additional care and quilted padding is then used on furniture, entertainment centers, and large items before we carefully place them in the truck. 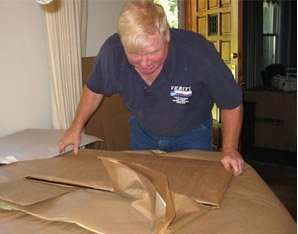 Verity packing services are available for both local and long distance moving. We can relieve you of all or part of the burden of this cumbersome chore. If you’d like to pack some or all of your belongings yourself, we’ll deliver packing supplies to you within 24 hours of placing the order, and often on the same day. Should you choose to pack some of your own belongings or you are looking for some friendly advice about your move, check out Mike’s Corner for tips from Verity Van Lines owner, Mike Maffucci. Leave the packing to us. Since my family had used Verity multiple times in the past, I felt that you were the only movers for us.